What can I send to Australia? What items are restricted? At present we cannot accept Laptops, Tablets, Mobile Phones or any other item containing a lithium battery for delivery to/from Australia. For many people Australia is a long-haul destination. You may even need to take a few connecting flights to get you there. The last thing you want to do is lug around heavy baggage, especially if you have got a long activity-packed break planned, or if you are moving to Australia. Let Send My Bag help. We pick up your bags from your home and drop them off at your destination on our door to door service, taking away a lot of the hassle. It’s a fantastic option if you are worried you will go over your baggage allowance or if you have a lot of bulky equipment which can be tricky to transport. Australia is a great place for surfing, hiking, biking and other adrenalin-inducing activities, which require you to bring your own equipment. Send My Bag can easily deliver oversized items safely and securely, making your journey stress free. Students choosing to spend a term or their full degree course in Australia can benefit from sending their possessions to Australia. This will allow them to bring many more of their things with them than if they were just relying on a few checked pieces of luggage. They can also better enjoy their journey without the added stress of dragging several bags onto public transport. You can send your luggage and boxes to Australia with Send My Bag. If you are going on holiday to Australia, or if you are moving there permanently, you can save yourself a lot of hassle by sending your bags with Send My Bag. This way, you can bring many more items with you than you could ever do with just a few suitcases on your flight. You can also rest assured in the knowledge that your possessions are being taken care of for you, allowing you to get on with exploring your new surroundings. Send My Bag has numerous international routes, with a great-value flat rate for each route up to a massive 30 kg. This means that you can bring all your favourite things with you to help you set up home abroad. To learn more about sending luggage to Australia, visit our ‘How it works’ page, or our ‘FAQs’. You can send golf clubs to Australia with Send My Bag and so avoid any oversized or overweight baggage fees from your airline. There are several great golf courses to enjoy in Australia, such as Darwin Golf Club, Alice Springs Golf Club and The Australian Golf Club. Since you can use your own golf clubs you will be able to enjoy playing golf to the full. Read our guide on how to send golf clubs to find out about the best way to package your items.. If you are migrating to Australia in the hope of making a better life for you and your family, or if you are returning home to Australia, you will have to consider international removals to Australia in order to transport all of your possessions. Before you hand over anything to the movers, however, ensure that all your items are well packaged so that they won’t get damaged in transit. Use suitable packaging for your items and seal everything up well. Textbooks, literature books, clothes, DVDs and CDs are just some of the things a student needs to bring with them when they go abroad to study. If you are spending your degree course, or just a term, in Australia, you can send your possessions with Send My Bag. There are a great number of universities in Australia that you could choose to study at, with the top-rated universities being the Australian National University, the University of Melbourne and the University of Sydney. To find out about student shipping with Send my Bag and to get your 10% student discount, visit our student removals page. You could ask a friend or relative to send a package to Australia if you happen to leave something behind. Or, your friends and relatives could send a care package to Australia to help remind you of home. This is a great idea for expats who have gone to settle in Australia or for students who are feeling a bit homesick. Send My Bag can send parcels internationally to Australia for you. Make sure you choose a sturdy box when sending a parcel to Australia and tape it up well so nothing gets damaged in transit. Find out more about how to send a parcel with Send My Bag and how to package your items. Air freight is one way you could send items, such as a table or armchair, to Australia. Sending items by air freight usually takes one to two days, which is usually faster than sea freight shipping, but typically more expensive. The amount you will be required to pay will depend on the weight and size of your shipment. You will likely also have to use the services of a customs agent to handle customs clearance for you. And, you will need to arrange how to get your items to and from the airport. Costs could, therefore, quickly mount up. If you send internationally by air freight to Australia your items would likely arrive at one of the major airports, such as Sydney Airport or Melbourne Airport. You could choose sea freight rather than air freight to transport your possessions to Australia. This is an option if you don’t need to receive your items immediately. Again, this option is usually used when shipping large bulky items, such as a sofa or even a car. Sea freight usually means shipping items in large containers loaded onto cargo ships. It can be cheaper than air freight, but you will still need to use the services of a customs agent and will need to sort out how to get your items to and from the ports. So, the cost could end up being more than you first expected. When using container shipping to Australia your items will most likely arrive by ship at one of the major sea ports, such as the Port of Brisbane or the Port of Melbourne. But if a process, but all went well. Australia requires a B534 form (provided by Send My Bag) to be completed in order for personal effects to be cleared into the country. At present, Australian customs also require a copy of the receiver’s passport. You will have the ability to upload a copy of the consignee's passport from within your Send My Bag account. Shipments of used personal effects should not have a declared value over A$1000. A higher value may lead to additional customs clearance time and possible duties and taxes. Any shipments containing restricted items such as foodstuffs, seeds/nuts or wooden products may result in the items having to be cleared via Australian quarantine, which can result in customs delays and additional charges. The majority of Send My Bag shipments worldwide will not be stopped by customs as most countries offer a generous duty free allowance for personal effects. ‘Personal effects’ means used items which have been in the sender's possession for 6 months or more. If your bag is searched by Australian customs and brand new or commercial items are found, your shipment may be assessed for customs duties and taxes. If you are sending Christmas gifts to Australia please make yourself aware of potential customs duties in Australia, follow any advice provided by customs and attach all necessary documentation. As customs processes and allowances are different around the world, we advise all travellers to take 5 minutes to check how their personal circumstances and what they are sending will be assessed under the prevailing customs regulations of Australia. To find out more see our customs information page. In order to demonstrate that your bags or boxes consist of personal effects, you will be required to complete a brief non generic packing list online, entries to be made in the format: "2 x Woollen Hat, 5 x Pairs of Shoes, 3 x Cotton Shirt" and so on rather than as "10 x Used Clothing". Each item type must be added as a separate line on the packing list. If you require any more information on deliveries to and from Australia we provide comprehensive information on our website, or just give us a call if you are unsure; we are here to help. Australia allows gifts upto a value of $1000 to enter the country duty free. Where multiple gifts are sent for different people and the total value exceeds $1000, duty and tax will become applicable – Australian customs does not allow items within a consignment to be split for the purposes of tax and duty calculation. All shipments, regardless of gift status, are subject to an inspection by Australian Customs & Agriculture. If you’re looking for an adventure holiday or if you plan to start a new life for you and your family, Australia really is the place to go. As you may know, Australia’s summer ranges from December to February, hence Christmas BBQs on the beach. This means that winter falls between June and August with cooler temperatures. However, as Australia is so big, the country covers a number of climate zones with some places much cooler than others. Some of the top activities and must-see sites in Australia include snorkelling or diving round the Great Barrier Reef, taking a trip to Uluru and exploring the Blue Mountains National Park. It’s a great place to go trekking, mountain climbing, or to enjoy extreme sports. If you like to take it much, much easier, then Australia has some of the best beaches in the world. Why not spend the day at Bondi Beach, one of the most famous beaches there is. A bit further afield is Christmas Island which offers the perfect escape on its pristine beaches. If you prefer a cosmopolitan holiday, Australia’s vibrant and lively cities make a brilliant destination. The capital, Canberra, is the largest landlocked city and offers a unique insight into Australian life. Influenced by garden cities, buildings are intermixed with parks and gardens. The larger cities of Sydney and Melbourne are the more popular destinations for tourists and those looking to emigrate. 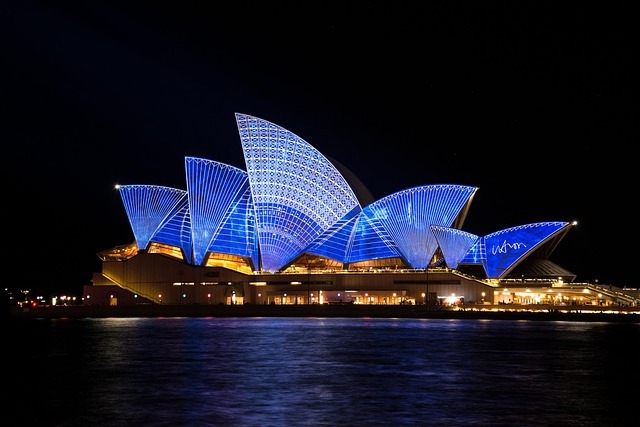 Sydney, of course, has its Opera House and is the site of the first British Colony in Australia, and is thus steeped in colonial history. Melbourne is in the state of Victoria. It is a fantastic cultural city filled with museums and galleries, and is home to a number of festivals.